This tomato dish is incredibly versatile. You can use it with pasta, spaghetti, most grains and it goes well with fish and chicken too. You can replace the Parmesan with Feta as that works really well or for a vegan/dairy free option leave the cheese out completely. It’s quite sweet so it’s a hit with kids and it can be made ahead. Simply make the sauce and boil the barley then when you are ready to serve, heat the sauce in the pan then add the cooked barley until it has warmed through. The sauce doesn’t work with large tomatoes so choose small ones such as cherry tomatoes. Cut the tomatoes in half then set aside in a bowl for about 30-40 minutes with a generous amount of salt. Salt the tomatoes as your would if you were seasoning a dish then repeat. The salt will draw the delicious liquor out of the tomatoes and form the base of the sauce. Cook the pearl barley as per the packet instructions then drain. 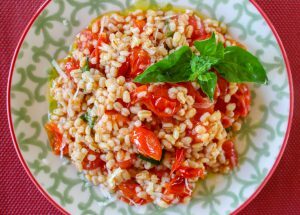 Whilst the pearl barley is cooking, take a wide-based pan (a frying pan or large cooking pot) and add a generous glug of olive oil. The oil should coat the base of the pan generously. Heat the oil on a high heat setting until hot but not smoking. It’s important that the oil is hot but not burnt/smoking as burnt olive oil is a carcinogenic. Once the oil is hot, quickly tip the tomatoes into the pan. The tomatoes will sizzle and spit so stand back. Don’t touch or move the tomatoes for a good minute then stir the tomatoes, adding the garlic and vinegar and cook for another minute. Turn the heat down to a medium heat setting to simmer for a few minutes then add the honey or sugar. Add fresh herbs (eg basil) and chilli (optional). 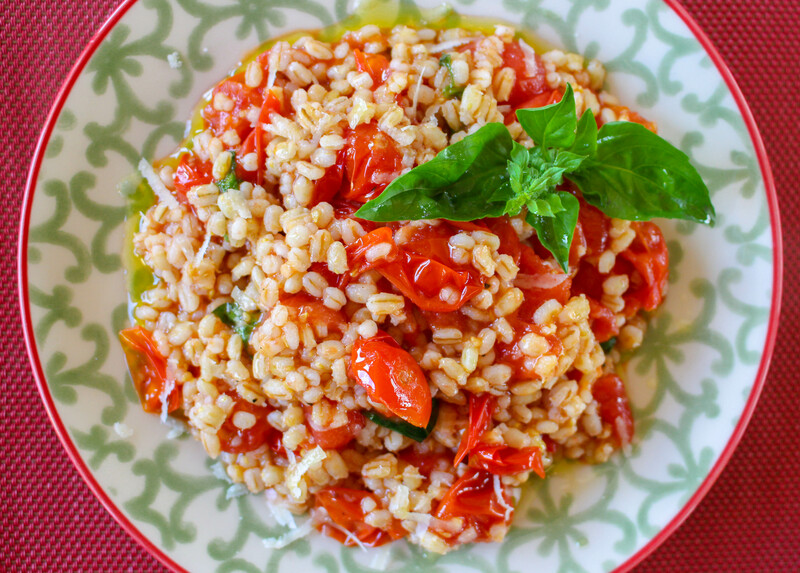 Pour the pearl barley into the tomato sauce, stirring well to combine. Add a small handful of grated Parmesan (optional) then serve topped with some shaved Parmesan and a glug of olive oil.